(Nanowerk News) Researchers at UC Santa Barbara have developed a new way to deliver drugs into cancer cells by exposing them briefly to a non-harmful laser. Their results are published in a recent article in ACS Nano, a journal of the American Chemical Society. "This entirely novel tool will allow biologists to investigate how genes function by providing them with temporal and spatial control over when a gene is turned on or off," explained Norbert Reich, senior author and a professor in the Department of Chemistry and Biochemistry at UCSB. "In a nutshell, what we describe is the ability to control genes in cells –– and we are working on doing this in animals –– simply by briefly exposing them to a non-harmful laser." The scientists used cancer cells from mice, and grew them in culture. They then introduced gold nanoshells, with a peptide-lipid coating, that encapsulated "silencing ribonucleic acid" (siRNA), which was the drug that was taken up by the cells. Next, they exposed the cells to a non-harmful infrared laser. "A major technical hurdle is how to combine multiple biochemical components into a compact nanoparticle which may be taken up by cells and exist stably until the release is desired," said Gary Braun, first author and a graduate student in UCSB's Department of Chemistry and Biochemistry. 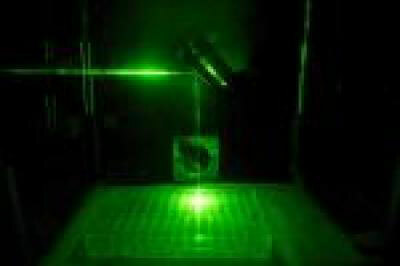 "Laser-controlled release is a convenient and powerful tool, allowing precise dosing of particular cells within a group. The use of biologically friendly tissue penetration with near-infrared light is the ideal for extending this capability into larger biological systems such as tissues and animals."